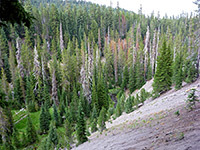 The 1.7 mile (loop) Annie Creek Canyon Trail is the closest path to the southern Crater Lake National Park entrance station along Hwy 62, starting behind the campground at Mazama Village, though the route is not well signposted so sees relatively few hikers. Annie Creek is a large drainage, flowing beside the highway for over ten miles, of which about half is through a deep ravine, bordered by steep, light-colored volcanic rocks, in places forming small pinnacles and sections of sheer cliffs. 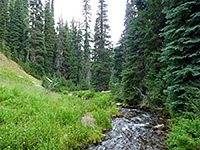 The stream originates just north of Mazama Village at Annie Spring, and the path explores the uppermost section of the ravine, already relatively deep - up to 300 feet. 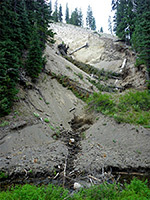 The trail heads south along the rim, descends to the valley floor, moves back upstream past a group of pumice formations at one point, then returns to the rim. The valley is enclosed and quite overgrown so there are no long distance views, but the surroundings are pleasant and peaceful, while other attractions of the hike are the variety of wildflowers, and the creek itself, flowing over small cascades and through clear pools. The hike does not appear to be signposted either from the highway or from Mazama Village. It starts beside site 11 along loop C of the campground, but there are no parking spaces here, so vehicles have to be left at the village, 0.3 miles away. Anticlockwise is the best direction for the loop as then the most of the elevation gain is done gradually, when walking upstream. 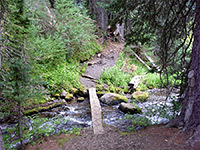 The Annie Creek Trail runs beside the rim at first, all along the edge of the large campground, which extends for over half a mile; right to the furthest point, whereupon it turns east and drops into the valley - down a little side gully then across wooded slopes via several steep switchbacks to the creek, which is crossed by a short bridge. Turning north, upstream, the creek is crossed several more times as it flows through the narrow valley, past a mix of open, grassy areas and patches of cool, damp woodland. One section is bordered to the east by a line of low, vertical pumice cliffs, eroded into interesting shapes - the Annie Creek Pinnacles. The canyon contains many seeps and boggy areas so is good for flowers, and most of the common species in the park are found here including several types of lupine, monkeyflower, fleabane and arnica. The upper end of the canyon is a little steeper and more forested, and the trail used to continue all the way to an alternative start point along the highway, but this section is disused; instead the path returns to the rim via a short climb, right back to the trailhead.